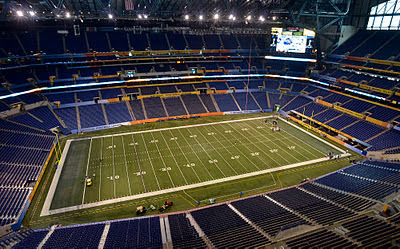 You do not need anyone to tell you Sunday's Super Bowl XLVI has all of the ingredients for ratings gold. But will it top last year's ratings record of 111 million viewers when the Green Bay Packers beat the Pittsburgh Steelers? All indications say yes. It's pretty simple, two of the most recognizable figures in sports facing each other with two giant media markets. It's the perfect formula for television ratings, and on Sunday, it will likely set the all-time record for the highest rated Super Bowl, and highest rated U.S. program of all-time. Last year's game was more than just a worldwide television event, it was a game featuring two franchises with some of the most passionate followings in professional sports. But when it comes to numbers, how well do the Packers and Steelers compare to the Patriots and Giants? They don't. The Patriots' average away attendance in 2011 was fifth in the league with 70,580. And who was number one? That's right, the New York Giants with 74,544. The strong fan bases between the Patriots and the Giants, in addition to the massive media markets they represent, may very well be just enough to create the highest rated U.S. television program of all-time. Will the fact that this game is so region-specific hurt the ratings potential? No, because there is still enough of a west coast following for both of these teams. This Super Bowl simply has no flaws for a potential television ratings record. As fans across the country anticipate the big game, the NFL can be nothing but proud of what the outcome may be.